WSJV-28 is a South Bend, Indiana-based television station and a part of the FOX network. 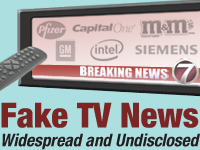 In response to the Center for Media and Democracy's (CMD) Fake TV News report, station news director Ed Kral contacted CMD to declare that the March 16 incident referenced above was an accident, and that he would look into the circumstances behind the airing of a complete and undisclosed VNR from General Motors. Kral states that it's WSJV-28 policy to not use VNRs at all, and will share the results of his investigation with CMD.